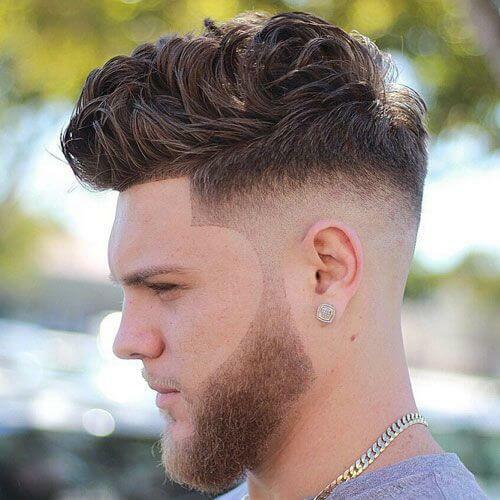 Short for “temple fade”, the temp fade haircut is rocking the trends charts for men’s hairstyles this year. 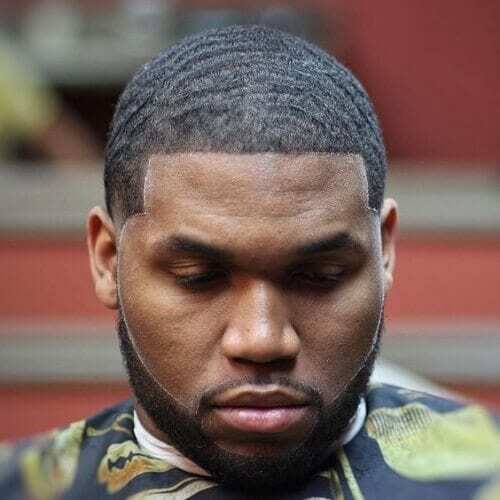 Also called the “box fade”, “line up”, “blow out” or “Brooklyn fade”, the temp fade involves carving out a man’s hairline in a rectangular shape. The results? An extremely well-defined hairstyle that will capture the attention of anyone you come into contact with. Find the best inspiration for yours below! With temp fades, the most popular way to go is low. 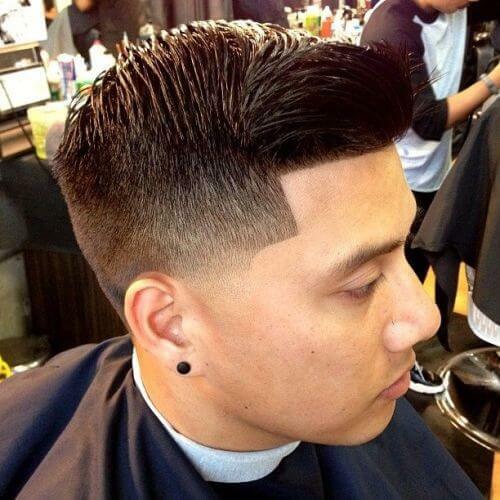 By using a low fade haircut, you can outline just the bottom portion of your hairstyle. It won’t be too flashy and it will add just the right amount of definition to your appearance. A cool part about the temp fade haircut is that it works for any hair lengths. 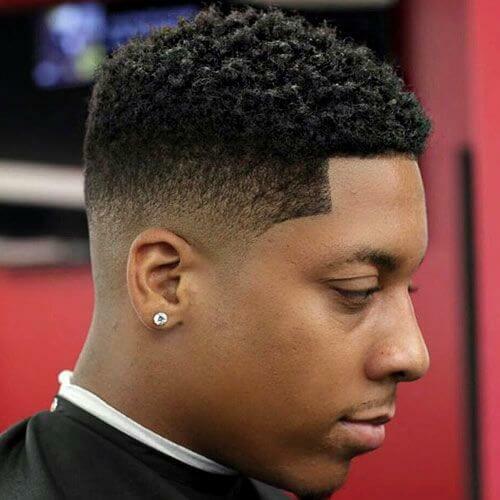 Even if you have super short hair, your barber can contour your hairline in the rectangular shape associated with the temple fade. The results will be awesome. 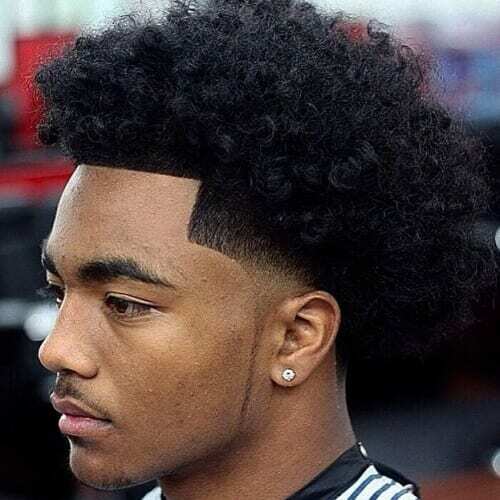 Men with afros are some of the luckiest guys when it comes to temple fade haircuts. 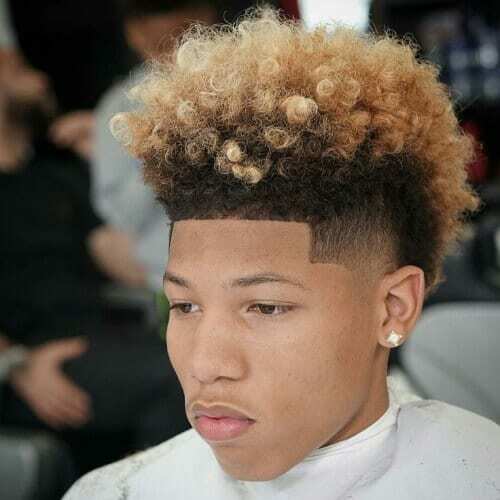 They can have a full fro going and add this effective detail without ruining the rest of their hairstyle. In other words, if this is your case, you can rest assured that your afro won’t be affected. Want a more dramatic impact for your hairstyle? 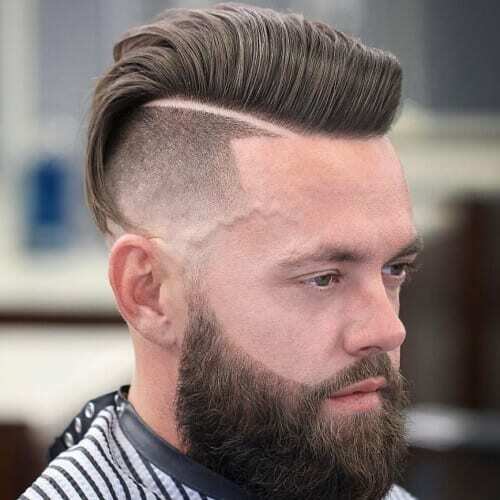 Combine your temp fade haircut with a skin fade. 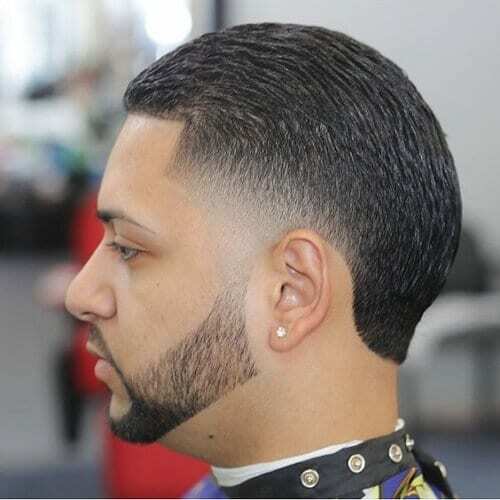 Also known as a bald fade or razor fade, the skin fade haircut involves completely shaving the lower part of your head. However, the fade gradient will still be present at the top. 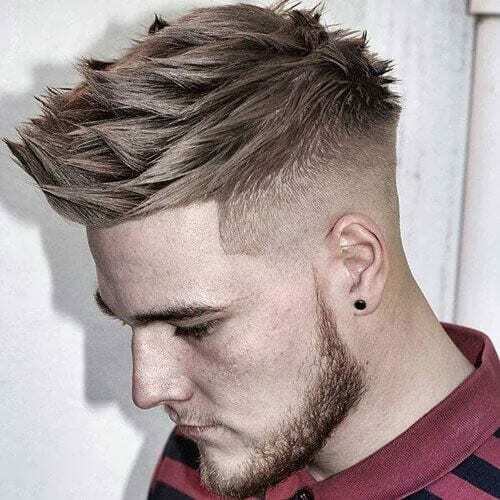 If you’re not one for extremes, the mid fade haircut is always a nice alternative. With this hairstyle, the transition from longer to shorter hair will be about at the middle part of your head. 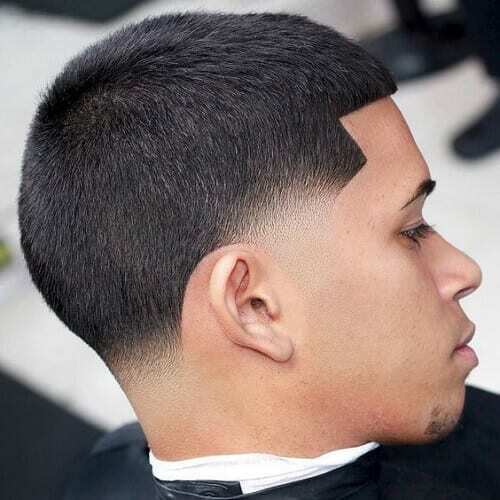 This way, the fade won’t be too discrete nor too flashy. 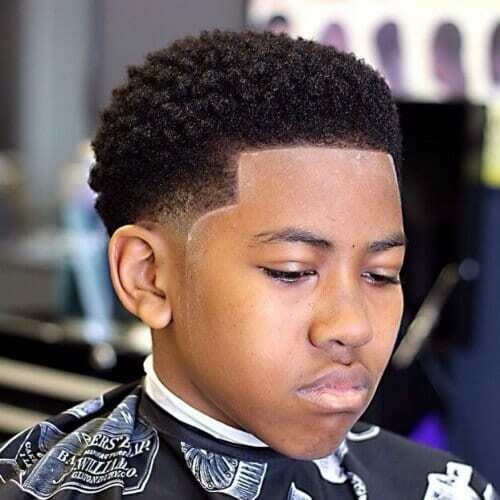 Most of the time, you will see temple fade haircuts associated with afro-textured or curly hair. Nevertheless, you should be aware that it looks just as good on men with straight hair. Even more so, your texture will allow a cleaner line up in the front. 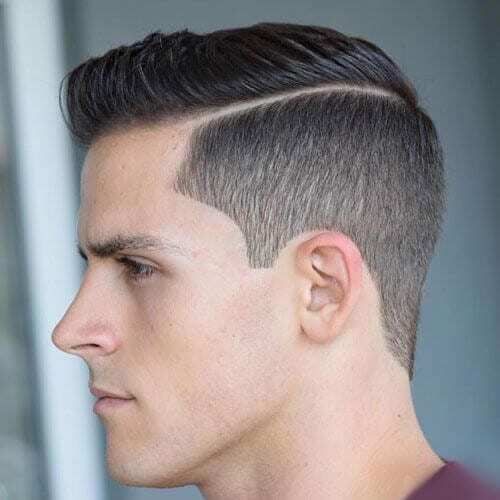 To support our previous claim, here’s a photo with a temp fade haircut on a guy with straight and slicked back hair. Even though the hair of the model is shorter here, you can easily pull the look off with longer hair too. If you want your haircut to really pop, think about getting a high temp fade. 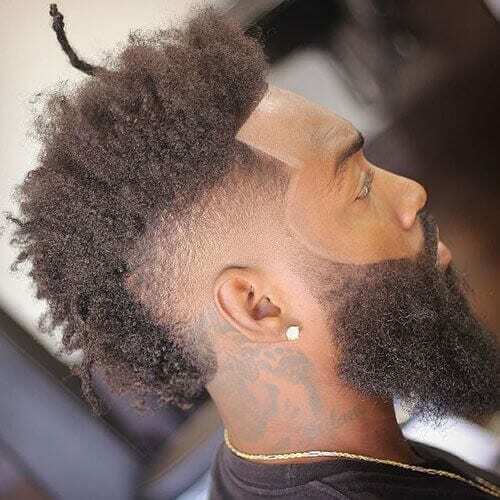 Like you probably have guessed, this hairstyle involves starting the fade at a higher point on your head. As a result, the overall undercut will be more pronounced. One of the hottest trends in the past few years in with temp fades is experimenting with color. To put it otherwise, you can get an additional hair color to go with your natural one. The most popular is blonde, but feel free to go with your instincts regarding the shade you add. 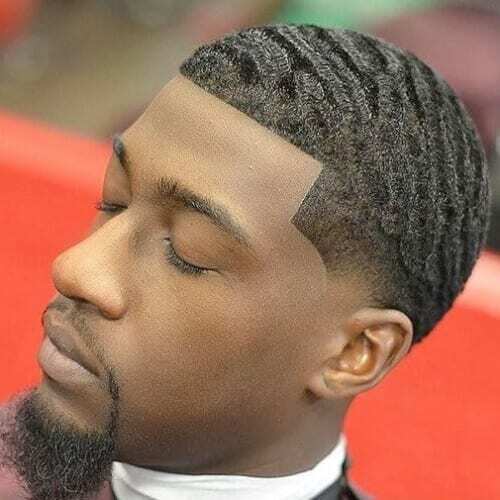 360 waves are an excellent way to obtain a dynamic hairstyle. Deep waves, as they’re often called, basically add grooves to your hair to make it seem more textured. Pair them with a line up and you’ll have a super fresh haircut. You can still rock a temp fade haircut perfectly even if you don’t have a full afro. 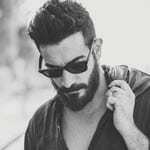 In fact, some men look even more appealing with a smaller and well-trimmed afro, so make sure you make the choice that best flatters your features. If you like the idea of waves in your hair but you don’t want full definition, you can tone down your deep waves to a wavy hairstyle. As you can see in this photo, the grooves are noticeable, but not as in-your-face as in our previous example. Braids have always been a wonderful part of African culture for men and women alike. The good news is that they look amazing with a temp fade, especially if yours are braided towards the back of your head. The beard is also a nice finishing touch. We’re glad that the temp fade isn’t a restrictive haircut. 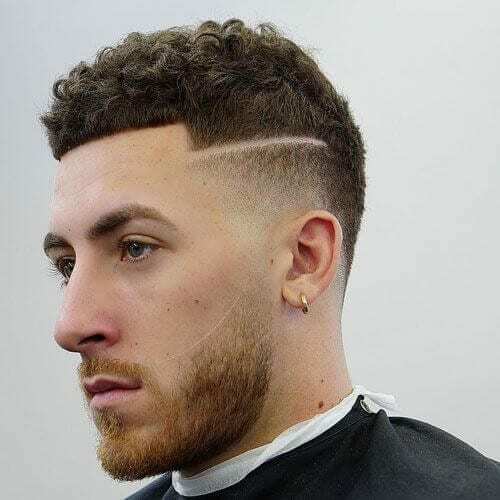 It’s actually one of the few barbershop hairstyles truly defined by versatility, allowing combinations with various other hairstyles. 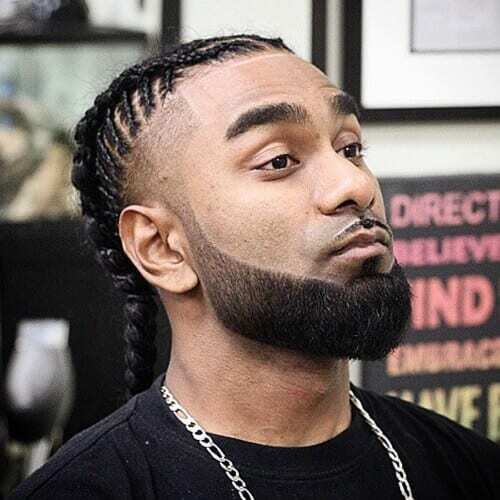 Take this combover hairstyle, for example. 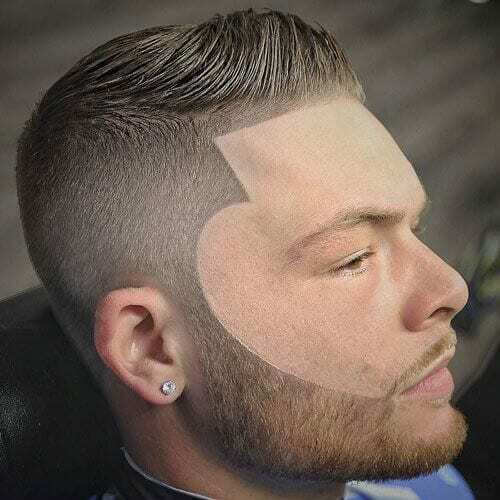 The box fade is just what it needed. Not afraid to get an edgy haircut? A hard part is a must-have. Regardless of how you decide to get yours, a hard part will spice up any regular haircut. In this situation, it outlines the mohawk-like top part of the temp fade haircut. 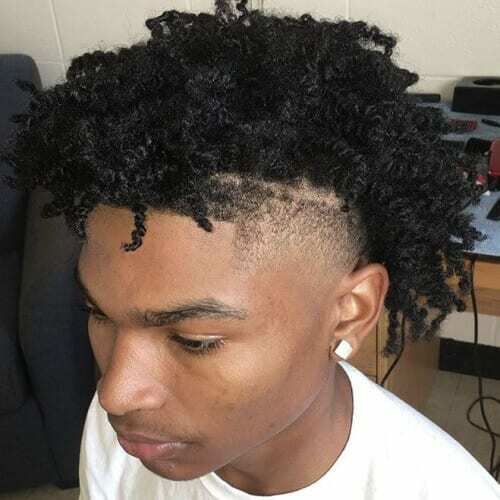 Want to get the perfect curls in your short afro? Sponge twists are an irreplaceable tool in the African hair community. Your barber will know all about them; all you have to do is ask him and find out if it’s the best option for you. 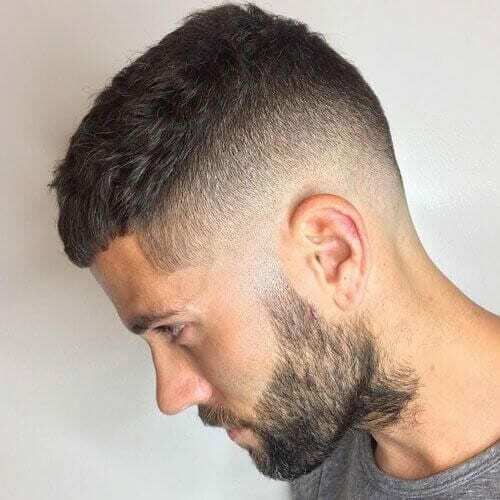 You can look outstanding with a temple fade haircut even if you have straight, medium-length hair. 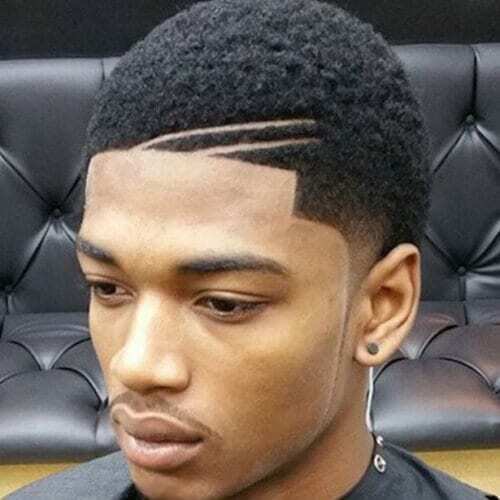 As long as you make sure the top is well-styled, you will enjoy all the benefits that a box fade offers. 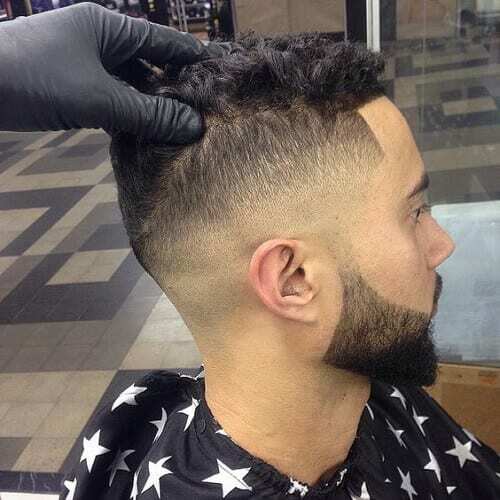 Make sure you touch up the haircut often to keep it looking fresh. You’ll probably have the easiest time maintaining your temp fade haircut if it’s combined with a short haircut. 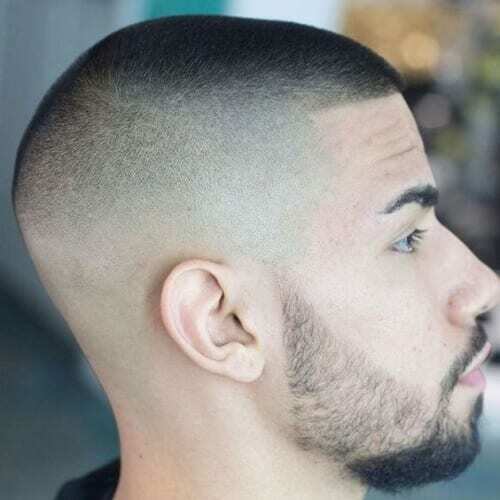 The buzz cut is one of the most popular military-inspired haircuts for men who aren’t into heavy styling, not to mention that it looks great with a line up. 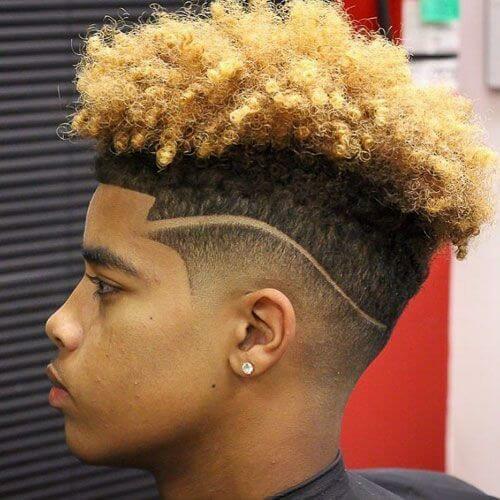 Spiking your hair won’t be an issue if you get a temple fade. If anything, it will help you accentuate the spiky top of your hairstyle. 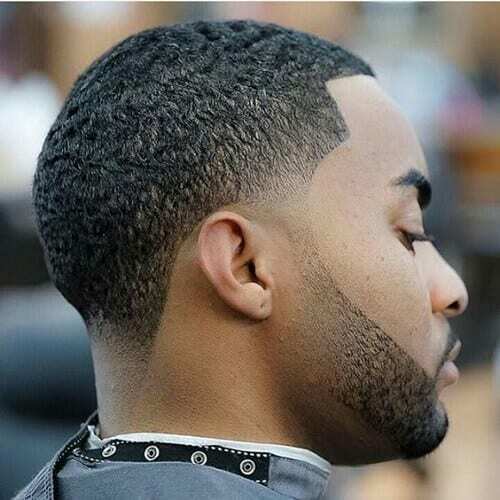 Like with all temp fades, make sure you visit your barber periodically to cleanly shave around your hairline. Another army favorite that goes with the temp fade like a match made in heaven is the crew cut. Basically, you’ll make the most of an easy-going hairstyle without running out of styling ideas. Choose the position of your fade (high, mid or low) and go! Now, this is what we call a unique temp fade. It was specifically designed to bring out the best in the bearer’s features, from his beard to his jawline. Additionally, just look at how cleanly shaven the lines are. Kudos to the barber! Will a hard part not boost your appearance the way you’d like it to? There’s always the shaved line as an alternative. You can make yours short or long, depending on your preferences. Simply choose the side you want to get it on and make it stand out. The quiff is known for being an extremely classy haircut for men of all ages. But what if you don’t want yours to result in a pretty boy effect? A temp fade is just what you need to make it edgier. 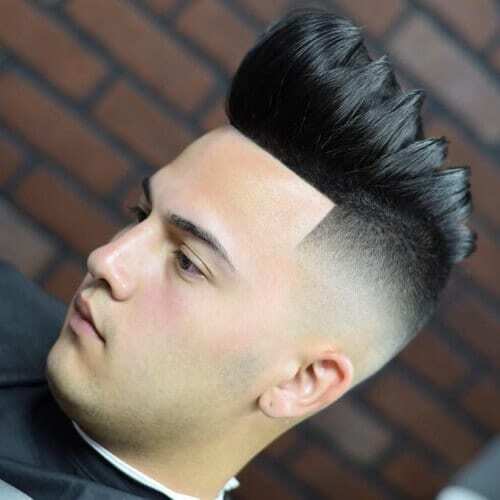 You don’t even have to get a visible undercut fade; the line up will be more than enough. You already know that braids look amazing with temp fades. But what if you’re not sure what specific braids you should go for? 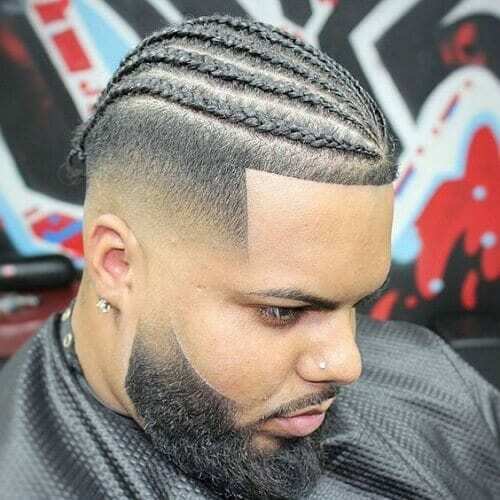 If you’re out of ideas, you should know that you can never go wrong with cornrows. Pick your favorite design and rock it! 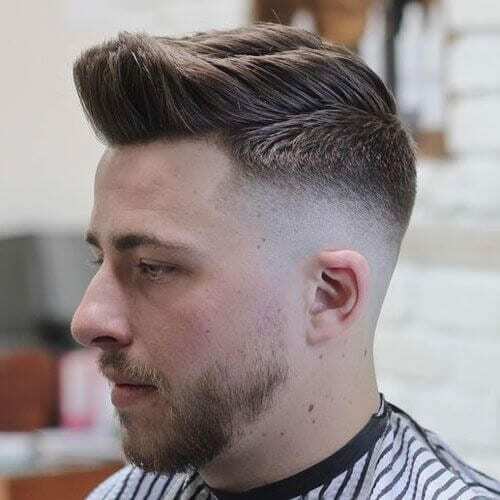 For more than half a century, pompadours have been regarded as one of the most handsome hairstyles for men with fine tastes. 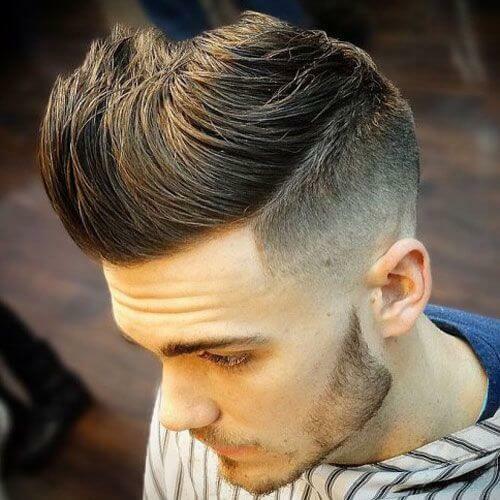 Although it’s a classic hairstyle, it looks brilliant in modern adaptations, such as a clean temp fade haircut. Oftentimes, a discrete haircut is a winning one. 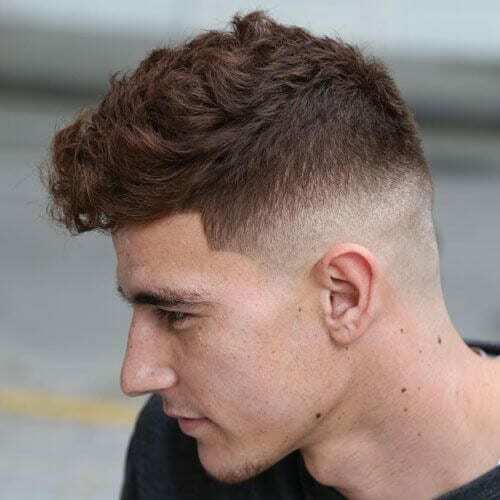 If you want the steep angle associated with a temp fade but without heavy side-shaving, this is the approach for you. Focus on the box shape and shave down the inner part of your sides only subtly. Believe us, receding hairlines aren’t fun for anyone to deal with. 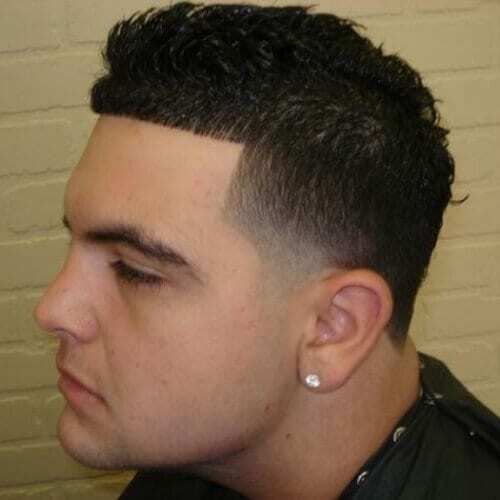 Nevertheless, there are plenty of smart hairstyles for men with receding hairlines that you can experiment with. In this case, the temp fade is ideal for covering up any flaws. To prove a point about long hair and temp fades, here’s an example that will make you completely understand why they work amazingly well together. 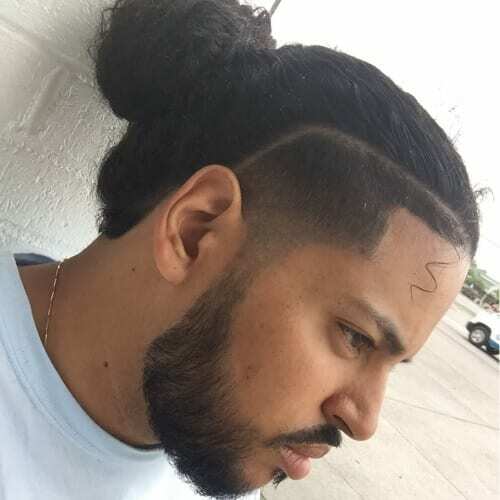 Not only does a guy with long hair and a temple fade look appealing with his hair down, but he also does when wearing a man bun. 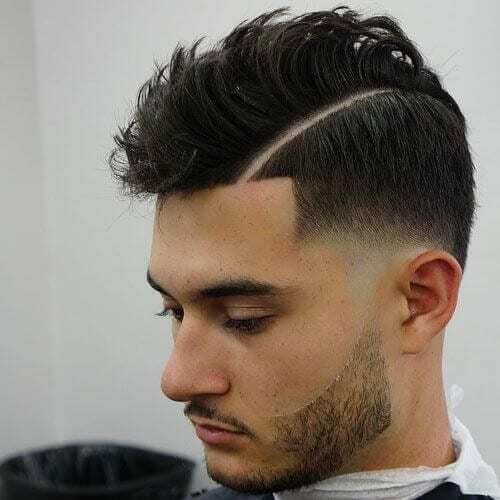 A wavy shaved line is a funky alternative to the straight recommendation we talked about earlier. It’s the perfect detail for a guy who has a bright personality and wants to convey it through his hairstyle. 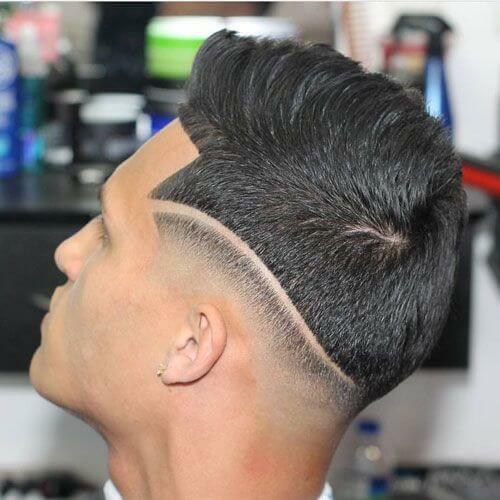 You can shave wavy line on both sides of your head, or you can opt for one on the left or right. Mohawk temp fades are a cool way to show that you’re a rebellious guy with a taste for unconventional hairstyles. If your hair is afro-textured, your mohawk will be even more original. We recommend that you keep the mohawk portion of the hairstyle wider for a better visual impact. What if you’re a Caucasian man that struggles with thick hair? Instead of chopping it all off, you can try this practical and pleasing hairstyle out. Thanks to the length, it won’t restrict your styling options. At the same time, it won’t have your hair sticking out in all the wrong directions. 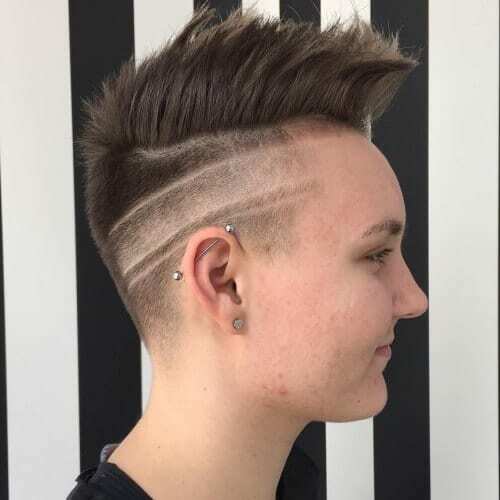 To continue our series of shaved line temp fades, we want to show you this funky idea. It doubles the coolness of the hairstyle by using two shaved lines instead of one. Plus, they’re shaved diagonally to create an interesting visual effect. It’s almost impossible to get a Caesar cut without having a temp fade, at least if you want it to be good-looking. Consequently, you should always speak to your stylist about cleaning up your hairline, especially when getting a Caesar cut. 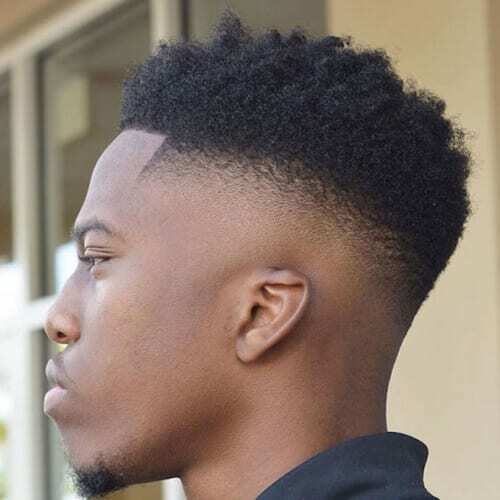 Super fresh would be an understatement when describing the flattop, especially when it’s done the right way. 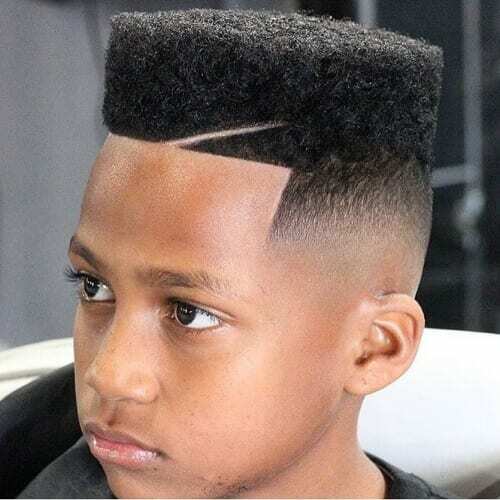 As you can see on the little dude in this pic, a flattop with a temp fade haircut looks fly. We also like how the shaved line completes the hairstyle. Getting a clean line up doesn’t necessarily involve cleanly cutting the rest of your hair. If you’re a fro guy, we actually encourage you to consider leaving it all natural. 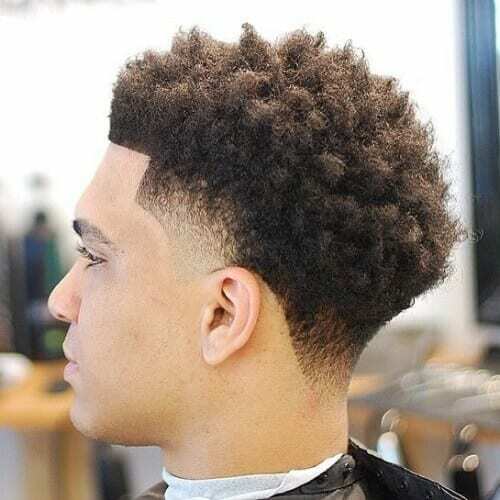 We particularly recommend this idea for men with thicker and bigger curls in their afros. If you’re nostalgic for the spiked bangs trend, you’ll be happy to know that the fringe up is now in style. It’s pretty much like the early 2000s hairstyle, just that it uses a softer approach to styling. 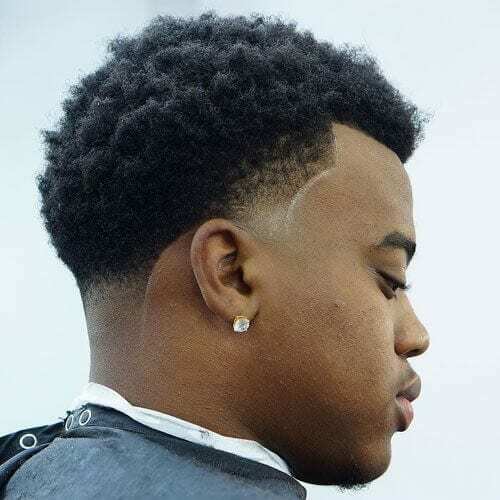 A temp fade haircut will help you trace it admirably. 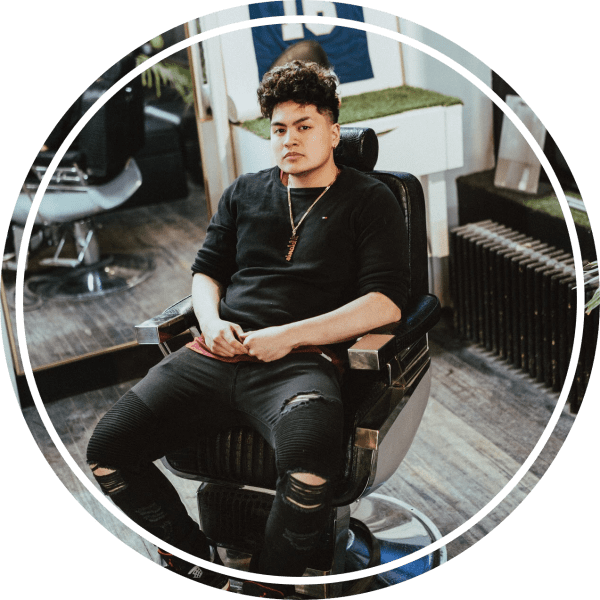 Whether you end up getting a temp fade or not, you should know about the faux hawk if you’re not already familiar with it. Essentially, it’s the more accessible version of a mohawk, meaning that it’s easier to wear in all sorts of social environments. You can tell by now that military cuts serve as continuous inspiration for modern hairstyles. For instance, the high and tight haircut is the temp fade’s best friend. The two cutting styles complement each other impeccably. 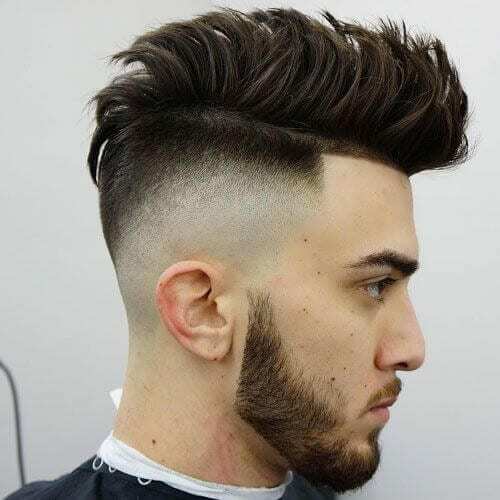 In case you’ve decided on getting a quiff hairstyle, here’s another example of how you can get it for your temp fade. In this photo, you can see how a quiff temple fade would look with longer hair. Make sure you keep it neatly swept to the side. 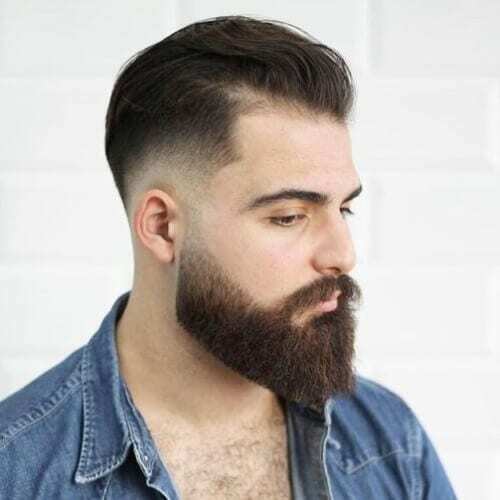 The French crop is one of the top trending hairstyles of the year for men. We’ve previously explained how it resembles the Caesar haircut, just with longer bangs. Now, you can see how it works with a temple fade haircut. Is one shaved line not enough for you? Two aren’t either? Well, it’s time to start thinking about a temp fade with a truly original design. Think of your barber as the artist and your hair as your canvas. What will you create? If you’re getting a mohawk with a temp fade, we want to introduce you to a detail we love. The V-shaped nape has been trending for as long as we can remember as a feature for all sorts of hairstyles, including the one depicted in the photo above. 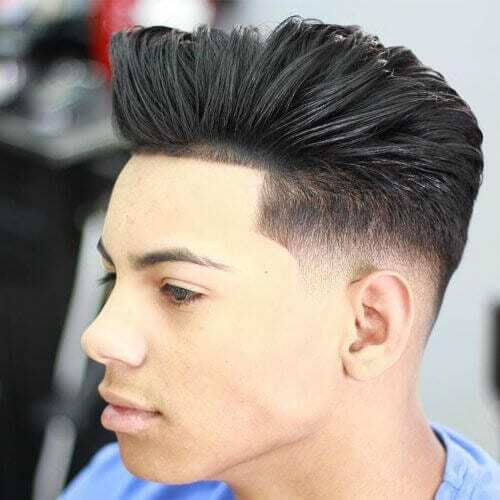 In addition to the French crop or quiff, the angular fringe is all the rage among guys these days, especially teens. If you want to keep up with the latest trends while defining your hairline, get a temp fade with an angular fringe hairstyle. You don’t always have to add color to a large portion of your hair when dyeing it. Sometimes, just coloring specific sections will bring the hairstyle to life. For example, colored tips have the power to draw just the right amount of attention to curly hair. Want to give your afro a fresh makeover? Start twisting! Creating small, twisted braids will protect your natural hair while revamping your style. Still, we recommend getting them done by a professional so the results will be up to par. Surgical lines certainly are a sight for sore eyes. 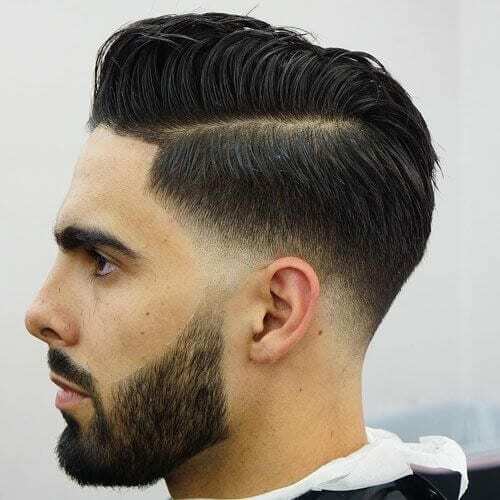 This particular style of shaved lines is associated with a clean, arched line that starts higher in the front and gets lower in the back. 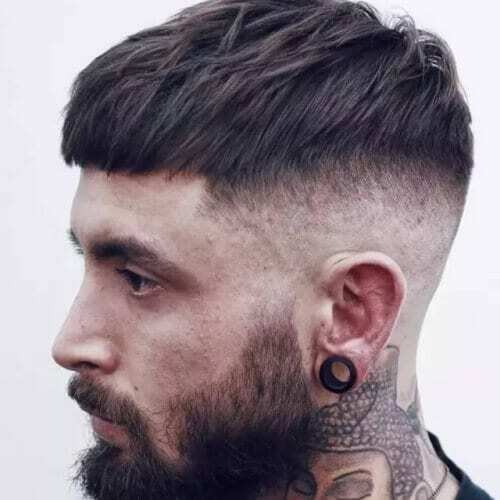 If dynamism is your thing, a two section surgical line haircut is for you. 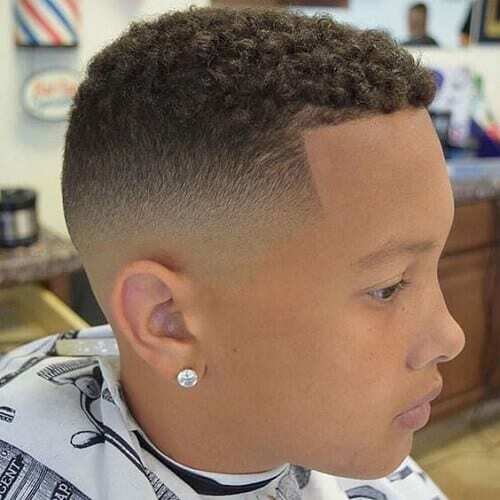 A temp fade isn’t always synonymous with edginess. In some cases, it can be the cherry on top for a dapper hairstyle. The Ivy League haircut is the ideal example. The temp fade is the detail that contributes to the polished outcome. 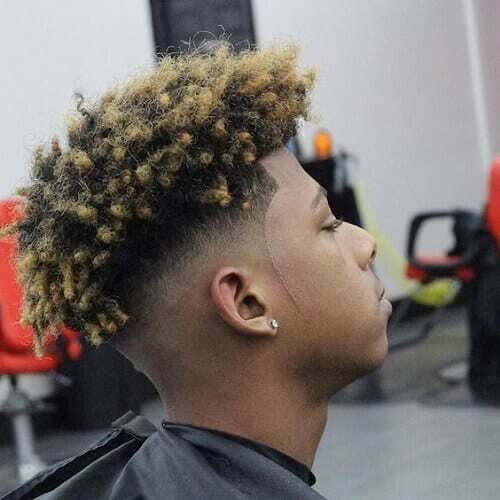 We are blown away by how clean this temp fade haircut is. 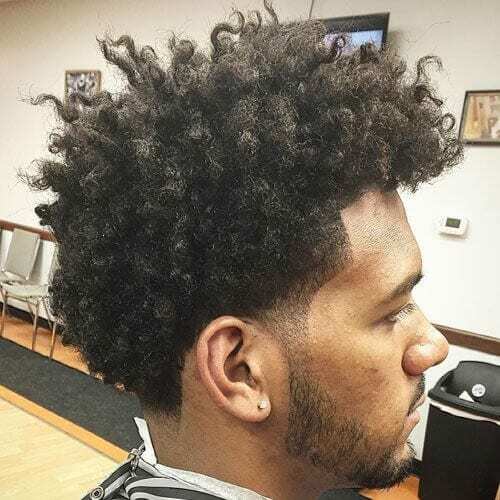 Even though the thickness of the client’s hair definitely played a big part in the jaw-dropping results, our hats go off to the skillful barber. If you have thick hair, think about bringing this photo with you as a reference. 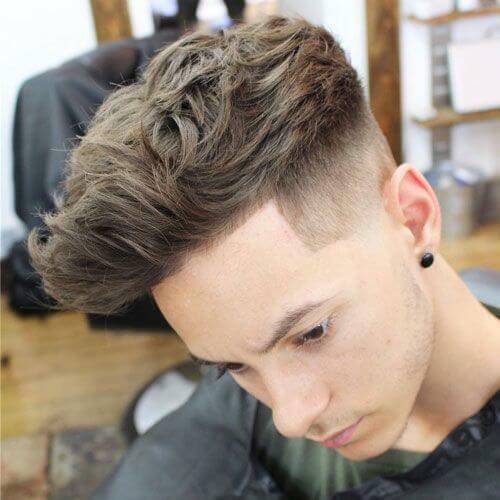 A recent trend that has been topping charts is the burst temp fade haircut. 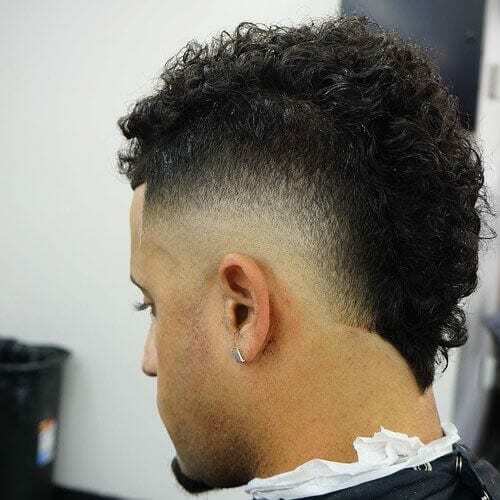 Also known as the South of France, it features a wide curly mohawk with a semicircle fade on each side. 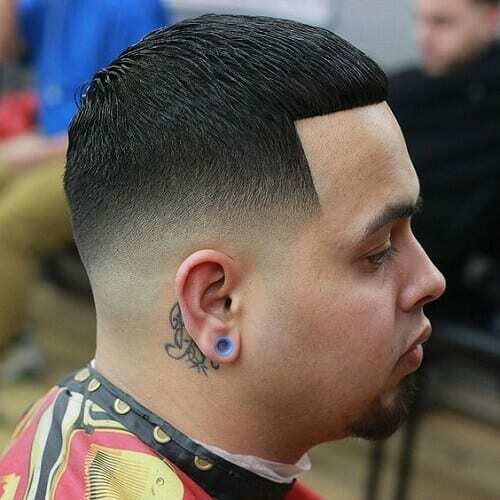 The shape of the fade is essential, hence the name of the haircut. Our last temple fade example combines three distinct elements that we like. Firstly, it has a super clean hard part. Secondly, it beautifully transitions from a skin fade to a beard. Thirdly, it includes really long hair. What are your thoughts on it? 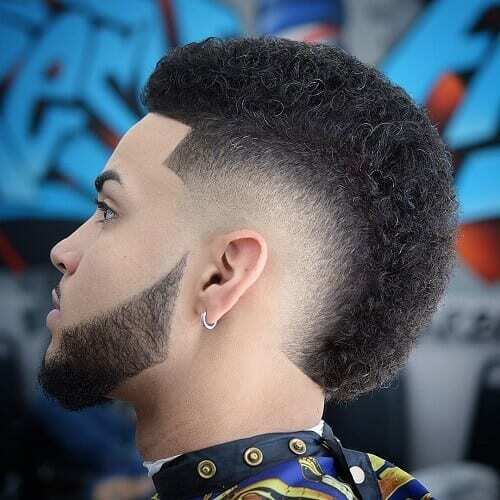 In summary, the temp fade haircut is a fine choice for men with all sorts of hair textures. It’s a versatile hairstyle that complements almost all face types and personalities, that range from edgy to classy. When getting yours, we recommend that you ask your friends about the best barber in your town. You won’t regret the results. Make sure you tell us about your experience in a comment below!